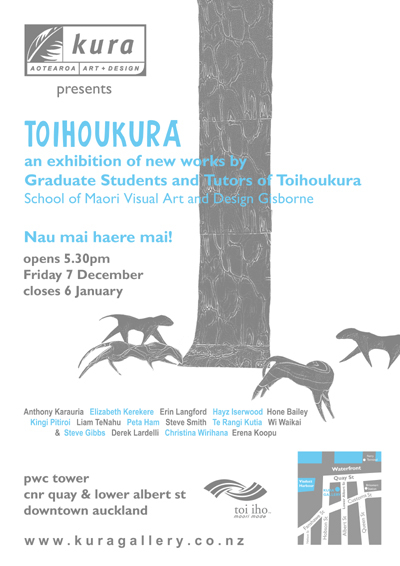 EXHIBITION AUCKLAND – TOIHOUKURA School of Maori Visual Art and Design Gisborne – Kura Gallery: Maori and New Zealand Art + Design. On 1 January 2011, TairÄwhiti Polytechnic officially merged with EIT Taradale becoming the off-site campus now known as EIT TairÄwhiti. On the new organisational structure, Toihoukura sits under the School of MÄori Studies – Te Manga MÄori, it continues to enjoy a high level of autonomy, creative license, and close links to hapÅ«, iwi and wider MÄori community groups. Te pou ka toko, te pou ka hiki, te pou ka eke. Te umu tipu te whaihanga. Whakapoua te hÄ o Rua kia rarama. He toirangi, he toimatua, he toi tangata ki ahau e! Whano, whana haramai te toki! Used to inspire, awaken the mind and quicken the thought processes no matter the subject being discussed. The reference to those who have passed on, and the processes and protocols they have left behind to guide in everyday life is acknowledged so that understanding and enlightenment are achieved. This finds its foundation in the story of how the three baskets of knowledge were acquired by Tane from the Twelfth Heaven and the sacred gods â€“ the knowledge to be shared amongst mankind. It is this thread that connects us with the power of higher learning and the pursuit of knowledge – so that we may find the world of light, and the world of living. It is a growing art, a veritable art, a living art!